Globally, the rise in research expenditures, deterioration in human health conditions and the need for novel and effective therapies have boosted the demand for drug discovery tools. In just the last few years, the drug discovery and development industry has undergone a major transition, with increased calls for efficient, user-friendly and affordable products. A new study by BCC Research examines all aspects of the drug discovery process, which consumes a major portion of drug development costs. Therefore, it is imperative for companies to use technologies that offer a high probability that their future drug product will be commercially successful. “The global biopharmaceutical industry has witnessed a significant transition in the past few decades, in particular in the drug discovery and development space,” said BCC Research analyst and report author Shalini Shahani Dewan. “The industry is focusing on new technologies to solve mechanistic mysteries, in order to identify a drug candidate molecule for therapeutic use. Genomic and proteomic analyses are finding applications in the understanding of various factors that regulate the functioning of cells at the genetic level.” The advent of high-throughput and automated methods involving in silico and computational approaches has transformed the field of drug discovery and development. A February 20, 2018 article published in Nature provides a comprehensive overview of such a computational approach. Deep-learning algorithms take raw features from an extremely large, annotated data set, such as a collection of images or genomes, and use them to create a predictive tool based on patterns buried inside. Once trained, the algorithms can apply that training to analyze other data. In biology, deep-learning algorithms dive into data in ways that humans cannot, detecting features that might otherwise be impossible to catch. Researchers are using the algorithms to classify cellular images, make genomic connections, advance drug discovery and even find links across different data types, from genomics and imaging to electronic medical records. Drug discovery – with its massive data sets – is a discipline that is amenable to deep learning. Here, deep-learning algorithms are helping to solve categorization challenges, sifting through such molecular features as shape and hydrogen bonding to identify criteria on which to rank potential drugs. For instance, Atomwise has developed algorithms that convert molecules into grids of 3D pixels. This representation allows the company to account for the 3D structure of proteins and small molecules with atomic precision, modelling features such as the geometries of carbon atoms. Those features are then translated into mathematical vectors that the algorithm can use to predict which small molecules are likely to interact with a given protein. Deep-learning tools could also help researchers to stratify disease types, understand disease subpopulations, find new treatments and match them with the appropriate patients for clinical testing and treatment. For instance, Answer ALS is an effort to combine a range of data­ – genomics, transcriptomics, epigenomics, proteomics, imaging and even pluripotent stem-cell biology – from 1,000 people with the neurodegenerative disease amyotrophic lateral sclerosis. Deep learning can then be applied to this data set to try to uncover a relationship between things that can be measured in vitro and what is happening to a patient. The article, Deep Learning for Biology, provides readers with an in-depth examination of this computational approach. 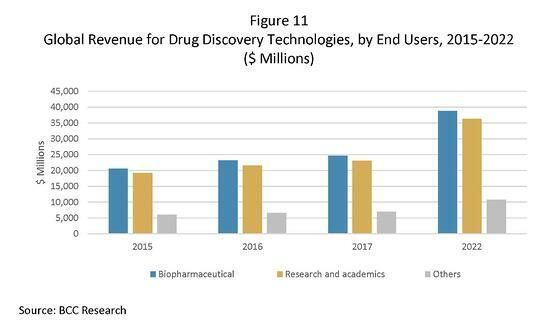 In recent years, the drug discovery technologies market has seen rapid progress. According to BCC Research’s analysis, this market has the potential to reach $85.8 billion in 2022, growing at a five-year compound annual growth rate of 9.4%. For its study, BCC Research segmented end users of drug discovery tools into biopharmaceutical companies, research and academia, and others, which includes contract research organizations. Biopharmaceuticals, the segment which holds the largest share of the overall drug discovery technologies market, is expected to reach $38.8 billion by 2022. 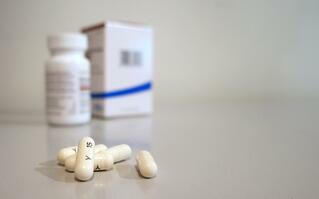 The increase mainly reflects further interest in genetic research and drug development. For more research and detailed market forecasts, download the free report overview for Drug Discovery Technologies (BIO020F).